Public Joint Stock Company Gazprom (Russian: Публи́чное акционе́рное о́бщество «Газпром», Publichnoe Aktsionernoe Obshchestvo Gazprom, abbreviated PAO Gazprom, Russian: ПАО «Газпром», IPA: [ɡɐsˈprom]) is a large Russian company founded in 1989, which carries on the business of extraction, production, transport, and sale of natural gas. The company is majority owned by the Government of Russia, via the Federal Agency for State Property Management and Rosneftegaz [ru]. The remaining shares are listed on public stock markets of Moscow, London and Frankfurt. The Gazprom name is a portmanteau of the Russian words Gazovaya Promyshlennost (Russian: га́зовая промы́шленность - gas industry). Gazprom is in the process of moving from Moscow to Saint Petersburg, where it is constructing Europe's tallest building for its new headquarters. Gazprom is the world’s largest oil producer, with producing oil through the largest natural gas field in the world, the Shtokman field. Gazprom was created in 1989 when the Soviet Ministry of Gas Industry was converted to a corporation, retaining its Russia-based assets. Gazprom is involved in the Russian Government's diplomatic efforts, setting of gas prices, and access to pipelines. Gazprom's production fields are located around the Gulf of Ob in Western Siberia. Plans have also been made to mine the Yamal Peninsula. Gazprom's gas transport system includes 158,200 kilometres of gas trunk lines. Projects include Nord Stream and South Stream. In 2011, Gazprom produced about 513.2 billion cubic metres (18.12 trillion cubic feet) of natural gas, more than seventeen percent of global gas production. Gazprom also produced about 32.3 million tons of crude oil and nearly 12.1 million tons of gas condensate. The company has subsidiaries in industrial sectors including finance, media and aviation, and majority stakes in other companies. In 1943, during World War II, the government of the Soviet Union developed a domestic gas industry. In 1965, it centralized gas exploration, development, and distribution within the Ministry of Gas Industry. In the 1970s and 1980s, the Ministry of Gas Industry found large natural gas reserves in Siberia, the Ural region and the Volga region. The Soviet Union became a major gas producer. In August 1989, under the leadership of Viktor Chernomyrdin, the Ministry of Gas Industry was renamed the State Gas Concern Gazprom, and became the Soviet Union's first state run corporate enterprise. In late 1991, when the Soviet Union dissolved, gas industry assets were transferred to newly established national companies, such as Ukrgazprom and Turkmengazprom. Gazprom kept assets located in Russia and secured a monopoly in the gas sector. In December 1992, when Boris Yeltsin, the Russian President, appointed Chernomyrdin, Gazprom's Chairman, his Prime Minister, the company's political influence increased. Rem Viakhirev took the chairmanship of Gazprom's Board of Directors and Managing Committee. Following the Decree of the President of the Russian Federation of 5 November 1992 and the Resolution of the Government of Russia of 17 February 1993, Gazprom became a joint-stock company. Gazprom began to distribute shares under the voucher method. (Each Russian citizen received vouchers to purchase shares of formerly state-owned companies). By 1994, 33% of Gazprom's shares had been bought by 747,000 members of the public, mostly in exchange for vouchers. Fifteen percent of the stock was allocated to Gazprom employees. The state retained 40% of the shares. That amount was gradually lowered to thirty-eight percent. Trading of Gazprom's shares was heavily regulated. Foreigners were prohibited from owning more than nine-percent of the shares. In October 1996, 1% of Gazprom's equity was offered for sale to foreigners as Global Depository Receipts. In 1997, Gazprom offered a bond issue of US$2.5 billion. Chernomyrdin, as Prime Minister of Russia, ensured Gazprom avoided tight state regulation. Gazprom evaded taxes, and the Government of Russia received little in dividends. Gazprom managers and board members, such as Chernomyrdin and the Gazprom Chief Executive Officer, Rem Viakhirev, engaged in asset-stripping. Gazprom assets were shared amongst their relatives. Itera, a gas trading company also received Gazprom assets. In March 1998, for reasons unrelated to his activities at Gazprom, Chernomyrdin was fired by Yeltsin. On 30 June 1998, Chernomyrdin was made Chairman of the Board of Directors of Gazprom. When, in June 2000, Vladimir Putin became the President of Russia, he acted to gain control over Russia's oligarchs, and increase the Government of Russia's control in important companies through a program of national champions. Putin fired Chernomyrdin from his position as the Chairman of the Gazprom board. The Russian Government's stock in Gazprom gave Putin the power to vote out Vyakhirev. Chernomyrdin and Vyakhirev were replaced by Dmitry Medvedev and Alexei Miller. They were Putin's prior employees in Saint Petersburg. Putin's actions were aided by the shareholder activism of Hermitage Capital Management Chief Executive Officer William Browder, and the former Russian Finance Minister Boris Fyodorov. Miller and Medvedev were to stop asset stripping at Gazprom and to recover losses. Itera was denied access to Gazprom's pipelines and came close to bankruptcy. Itera agreed to return stolen assets to Gazprom for a fee. In June 2005, Gazprombank, Gazpromivest Holding, Gazfond and Gazprom Finance B. V., subsidiaries of Gazprom, sold a 10.7399% share of their stock for $7 billion to Rosneftegaz [ru], a state owned company. Some analysts said the amount paid by Rosneftegaz for the stock was too low. The sale was completed by 25 December 2005. With the purchased stock and the thirty-eight percent share held by the State Property Committee, the Government of Russia gained control of Gazprom. The Government of Russia revoked the Gazprom twenty percent foreign ownership rule and the company became open to foreign investment. On 5 July 2006, the Federal Law, On Gas Export, was passed, nearly unanimously, by the State Duma and on 7 July 2006, by the Federation Council. On 18 July Putin signed the new legislation and on 20 July 2006, the law was published. It gave Gazprom the exclusive right to export natural gas from Russia. The ceremony marking the opening of a LNG production plant built as part of the Sakhalin-II project. On 4 September 2012, the European Commission announced an anti-trust investigation into Gazprom's activities. This was based on "concerns that Gazprom may be abusing its dominant market position in upstream gas supply markets." On 21 May 2014, in Shanghai, Gazprom and the China National Petroleum Corporation made a contract worth $400 billion over thirty years. The contract was for Gazprom to deliver 38 billion cubic meters of natural gas per year to China beginning in 2018. In August 2014, construction began with pipes for the Power of Siberia pipeline delivered to Lensk, Yakutia. Russia will start supplying natural gas to China through the Power of Siberia pipeline on 20 December 2019 as part of the two countries' $400 billion energy pact. Beijing and Moscow are now negotiating over a second Far Eastern gas pipeline. In April 2001, Gazprom acquired NTV, Russia's only nationwide state-independent television station from Vladimir Gusinsky's company, Media-Most holdings. In 2002, the Gazprom subsidiary Gazprom Media acquired all of Gusinsky's shares in companies held by Media-Most. In December 2006, Gazprom signed an agreement with Royal Dutch Shell, Mitsui and Mitsubishi, to take over fifty percent plus one share of Sakhalin Energy. In June 2007, TNK-BP, a subsidiary of BP plc, agreed to sell its stake in Kovykta field in Siberia to Gazprom after the Government of Russia questioned BP's right to export gas from Russia. On 23 June 2007, the governments of Russia and Italy signed a memorandum of understanding towards a joint venture between Gazprom and Eni SpA to construct a 558-mile (900 km) gas pipeline to carry 1.05 trillion cubic feet (30 km3) gas per year from Russia to Europe. This South Stream pipeline would extend under the Black Sea to Bulgaria with a south fork to Italy and a north fork to Hungary. On 1 December 2007, during a visit to Turkey, Putin said the project would not proceed and 63 billion cubic metres per year (bcm/y) of gas would be shipped to Turkey instead of Bulgaria. Bulgaria was being sued by the European Union for signing a contract with Russia, which was not aligned with European Union regulations.The president of Bulgaria, Rosen Plevneliev, pressured the European Union and Russia to quickly resolve the matter. In late November 2013, Gazprom expanded its media interests by acquiring Profmedia from Vladimir Potanin. In June 2014, Gazprom negotiated with the International Petroleum Investment Company (IPIC of Abu Dhabi) over a 24.9 percent stake in the Austrian oil and gas firm OMV. In July 2014, Gazprom acquired Central Partnership, one of the largest film distributors in Russia. Countries by natural gas proven reserves (2014). Russia has the world's largest reserves. In 2011, Gazprom produced 513.17 billion cubic metres (18.122 trillion cubic feet) of natural gas, which was 17 percent of the worldwide production and 83 percent of Russian production. Of this amount, the Yamburg subsidiary produced 41 percent, Urengoy 23.6 percent, Nadym 10.9 percent, Noyabrsk 9.3 percent and others 15.2 percent. In addition, the company produced 32.28 million tons of oil and 12.07 million tons of gas condensate. Gazprom's main fields are located in the Nadym-Pur-Taz region (near the Gulf of Ob) in Yamalo-Nenets Autonomous Okrug in Western Siberia. Historically, the three largest fields are Medvezhe, Urengoy and Yamburg. After more than twenty years of production, the fields are now in decline. Production from the fields has decreased by twenty to twenty-five bcm per year. The production at Zaporliarnoe, Gazprom's fourth largest field, increased until 2004, offsetting the decline in the other fields. Since 2004, Gazprom has maintained production by activating new smaller fields and by purchasing production assets from other companies. Gazprom Neft produces crude oil. In 2005, Gazprom purchased 75 percent of the Gazprom Neft shares for $13.1 billion. Source: Gazprom in figures 2004-2008, 2007-2011, 2009-2013 and 2012–2016. Gazprom's ability to supply natural gas to domestic market and for reexport has relied to a large extent on imports from Central Asia. In 2007, Gazprom imported a total of 60.7 billion cubic metres (2.14 trillion cubic feet) from Central Asia: 42.6 billion cubic metres (1.50 trillion cubic feet) from Turkmenistan, 8.5 billion cubic metres (300 billion cubic feet) from Kazakhstan, and 9.6 billion cubic metres (340 billion cubic feet) from Uzbekistan. In particular, Gazprom purchased seventy-five percent of Turkmenistan gas exports in order to supply gas to Ukraine. In 2008, Gazprom paid $130/mcm to $180/mcm for gas from Central Asia. In 2015, Gazprom's proved and probable reserves of natural gas were 23.705 trillion cubic metres (837.1 trillion cubic feet), a 3.8% increase from the 2011 figure which represented 18.4% of the world's reserves. In 2015, the reserves of crude oil were 1.355 billion tons and the reserves of gas condensate were 933.3 billion tons. 59.8 percent of Gazprom's natural gas reserves (Categories A+B+C1) were located in the Urals Federal District (decreasing), 20.5 percent in the Arctic shelf (increasing), and 8.3 percent in the Southern Federal District and North Caucasus Federal District. Gazprom has invested about 480 billion rubles ($20 billion) in new major projects in order to maintain supply. Nearly 37 percent of Gazprom's reserves are located in the Yamal Peninsula and in the Barents Sea. One of Gazprom's major projects is the Blue Stream Pipeline. The Blue Stream Pipeline delivers natural gas to Turkey via the Black Sea. In 1997, the Blue Stream Pipeline agreement between Turkey and Russia was signed. In 2000, the first joint was welded. The pipeline has transported 16 billion cubic meters each year. Exploration of the Yamal peninsula has found reserves of over 10 trillion cubic metres of natural gas and over 500 million tons of oil and gas condensate. About 60 percent of these reserves are located in Bovanenkovo, Kharasavey and Novoportovo. The natural gas production capacity of the Bovanenkovo field was estimated to be 115 billion cubic metres per annum (4.1 trillion cubic feet per annum), with potential to increase to 140 billion cubic metres per annum (4.9 trillion cubic feet per annum). The Shtokman field is one of the world's largest natural gas fields. It is located in the central part of the Barents Sea, 650 kilometres (400 mi) northeast of the city of Murmansk and 1,000 kilometres (620 mi) west of the Yamal Peninsula. The field is estimated to contain up to 3.7 trillion cubic metres (130 trillion cubic feet) of gas. Potential production is 71 billion cubic metres per annum (2.5 trillion cubic feet per annum) in the initial phases, with a potential increase to 95 billion cubic metres per annum (3.4 trillion cubic feet per annum). Gazprom, Total (France) and Statoil (Norway) created a joint company Shtokman Development AG for development of the field. In 2008, Gazprom carried out 284.9 kilometres (177.0 mi) of explorative well drilling; 124,000 kilometres (77,000 mi) of 2D seismic and 6,600 square kilometres (2,500 sq mi) of 3D seismic survey. As a result, gas reserves grew by 583.4 billion cubic metres (20.60 trillion cubic feet), and crude oil and gas condensate reserves grew by 61 million tons. Gazprom carries out prospecting and exploration in foreign countries such as India, Algeria, Venezuela, Vietnam, Libya, Kazakhstan, Uzbekistan, Kyrgyzstan and Tajikistan. Gazprom's Unified Gas Supply System (UGSS) includes 158,200 kilometres (98,300 mi) of gas trunklines and branches and 218 compressor stations with a 41.4 GW capacity. The UGSS is the largest gas transmission system in the world. In 2008, the transportation system carried 714.3 billion cubic metres (25.23 trillion cubic feet) of gas. The UGSS has reached its capacity. Major transmission projects include the Nord Stream and South Stream pipelines, as well as pipelines inside Russia. In 2006, Gazprom sold 316 billion cubic metres (11.2 trillion cubic feet) of gas to domestic customers; 162 billion cubic metres (5.7 trillion cubic feet) to the rest of Europe; and 101 billion cubic metres (3.6 trillion cubic feet) to CIS countries and the Baltic states. Gazprom receives about 60 percent of its revenue from its sales to European customers. In 2008, the average gas price paid by Russian industrial customers was $71/mcm, while households paid $54/mcm. Gazprom sales of gas 2004-2008 in mega cubic meters (mcm). Since 2000, Natural gas prices have fluctuated. In late 2007, the price of natural gas at the New York NYMEX was 7,53 $ per MMBtu, at 26,4 m³ per MMBTU representing a price of $285 per 1000 Cubic metres. At the same time, based on their respective contracts with Gazprom, German customers paid (per cubic metre) $250, Polish customers $290, Ukraine customers $130 and Russian customers $49. Gazprom delivers gas to 25 European countries. Its main export arm is Gazprom Export LLC, founded in 1973 and before 1 November 2006 known as Gazexport, which has a monopoly on gas exports to countries outside of the former Soviet Union. The majority of Russian gas in Europe is sold on 25 year contracts. In late 2004, Gazprom was the sole gas supplier to Bosnia and Herzegovina, Estonia, Finland, Macedonia, Latvia, Lithuania, Moldova, Serbia and Slovakia. It provided 97 percent of Bulgaria's gas, 89 percent of Hungary's gas, 86 percent of Poland's gas, nearly 75 percent of the Czech Republic's, 67 percent of Turkey's, 65 percent of Austria's, about 40 percent of Romania's, 36 percent of Germany's, 27 percent of Italy's, and 25 percent of France's gas. 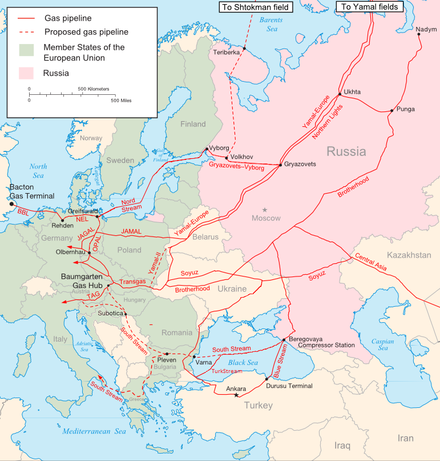 The European Union receives about 25 percent of its gas supply from Gazprom. In 2014, Europe was the source of 40% of Gazprom's revenue. The proportion of Europe’s gas bought in the spot market rose from 15 percent in 2008 to 44 percent in 2012. In September 2013, during the G20 summit, Gazprom signed an agreement with CNPC that the Henry Hub index would not be used to settle prices for their trades. 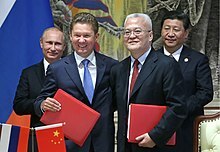 On 21 May 2014, Putin met with Xi Jinping and negotiated a $400bn deal between Gazprom and CNPC. Under the contract, Russia was to supply 38 billion cubic meters of gas annually over 30 years at a cost of $350 per thousand cubic meters beginning in 2018. During the first half of 2018, Gazprom increased its export about 8.7%. In 2013, the average price of Gazprom’s gas in Europe was about $380 per thousand cubic meters. China offered a loan of about $50bn to finance development of the gas fields and the construction of the pipeline by Russia up to the Chinese border, with the Chinese to build the remaining pipeline. On 1 January 2006, at 10:00 (Moscow time), during the Russia-Ukraine gas dispute, Gazprom ceased the supply of gas to the Ukrainian market. Gazprom called on the government of Ukraine to increase its payment for natural gas in line with increases in global fuel prices. During the night of 3 January 2006 and early morning of 4 January 2006, Naftogas of Ukraine and Gazprom negotiated a deal that temporarily resolved the long-standing gas price conflict between Russia and Ukraine. On 3 April 2006, Gazprom announced it would triple the price of natural gas to Belarus after 31 December 2006. In December 2006, Gazprom threatened to cease supply of gas to Belarus at 10 am Moscow time on 1 January 2007, unless Belarus increased payments from $47 to $200 per 1,000 cubic metres or to cede control over its distribution network. Some analysts suggested Moscow was penalising Alexander Lukashenko, the President of Belarus, for not delivering on pledges of closer integration with Russia, while others noted that other countries like Armenia were paying as much for their gas as Belarus would with the new price levels. Gazprom later requested a price of $105, yet Belarus still refused the agreement. Belarus responded that if supplies were cut, it would deny Gazprom access to its pipelines, which would impair gas transportation to Europe. However, on 1 January 2007, just a few hours before the deadline, Belarus and Gazprom signed a last-minute agreement. Under the agreement, Belarus undertook to pay $100 per 1,000 cubic metre in 2007. The agreement also allowed Gazprom to purchase 50 percent of the shares in Beltransgaz, the Belarusian pipeline network. Immediately following the signing of this agreement, Belarus declared a $42/ton transportation tax on Russian oil travelling through the Gazprom pipelines crossing its territory. On 13 March 2008, after a three-day period where gas supplies to Ukraine were halved, Gazprom agreed to supply Ukraine with gas for the rest of the year. The contract removed intermediary companies. On 1 April 2014, Gazprom increased the gas price charged to Ukraine from $268.50 to $385.50 (£231.00) per 1,000 cubic metres. Ukraine's unpaid gas bills to Russia stood at $1.7bn (£1.02bn). On 30 October 2014, Russia agreed to resume gas supplies to Ukraine over the winter in a deal brokered by the European Union. Gazprom is a vertically integrated company, one which owns its supply and distribution activities. Gazprom owns all its main gas processing facilities in Russia. It operates Russia's high pressure gas pipelines and since 2006, it has held a legal export monopoly. Other natural gas producers, such as Novatek, Russia's second largest gas company, are forced to use Gazprom's facilities for processing and transport of natural gas. At the end of 2008, Gazprom had 221,300 employees in its major gas production, transportation, underground storage and processing subsidiaries. Of these employees, 9.5 percent were in management, 22.9 percent were specialists, 63.4 percent were workers and 4.2 percent were other employees. Gazprom's headquarters are in the Cheryomushki District, South-Western Administrative Okrug, Moscow. Due to its large projects, including international pipes like Nord Stream and Turkish Stream, Gazprom is a substantial source of revenue for several domestic suppliers and contractors. As of 2017[update], Gazprom's main shareholders were the Federal Agency for State Property Management with 38.37% and Rosneftegaz [ru] with 10.97%. Together with a 0.89 share of Rosgazifikatsiya, they guaranteed a majority control of the company by the Russian government. The rest of the shares were held by investors, including 25.20% by ADR holders on foreign stock markets, and 24.57% by other legal entities and individuals. Gazprom is listed on the stock markets of Moscow, London, Berlin, Frankfurt and Singapore. It is the top component of the MICEX and RTS indices. Gazprom has several hundred subsidiaries in Russia and abroad which are owned and controlled directly or indirectly by the company. Gazprom is the owner and sponsor of the Russian Premier League football club FC Zenit Saint Petersburg and volleyball club VC Zenit-Kazan and Gazprom-Ugra Surgut at Russian Super League. On 1 January 2007, Gazprom also became the sponsor of the German Bundesliga club FC Schalke 04 at a cost of up to €25 million per year. On 23 November 2009, the partnership was extended for a further 5 years. The sponsorship was worth $150m (USD) over 5 years. On 9 July 2010, Gazprom became a sponsor of the Serbian SuperLiga football club Red Star Belgrade. In 2010, Gazprom was a Gold Partner of the Russian professional cycling team, Team Katusha, together with Itera, and Russian Technologies (Rostekhnologii). On 9 July 2012, Gazprom became a sponsor of the UEFA Champions League and UEFA Super Cup. The sponsorship continued for three seasons until 2015. On 17 July 2012, Gazprom became the official Global Energy partner of the UEFA Champions League 2012 winners Chelsea. The sponsorship continued for three years to 2015. In September 2013, Gazprom became an official partner of FIFA tournaments from 2015 to 2018. The contract includes the 2018 FIFA World Cup in Russia. Gazprom also was a sponsor for the defunct-Minardi F1 team in 2002-2003. According to geographer Richard Heede, Gazprom is second on the list of companies with the highest level of CO2 emissions globally in 2013 with 1,135 million tonnes (1.117×109 long tons; 1.251×109 short tons) in 2013, amounting to almost 3.4% of worldwide anthropogenic emissions. Gazprom has been ranked as between the 11th and 13th best of 92 oil, gas, and mining companies on upholding indigenous rights in the Arctic. Yuganskneftegaz was the core production subsidiary of the Yukos Oil Company, which was previously run by a Russian businessman, Mikhail Khodorkovsky. In 2003, the Russian tax authorities charged Yukos and Khodorkovsky with tax evasion. On 14 April 2004, Yukos was presented with a bill for over US $35 bn in back taxes and a demand to pay the entire bill the same day. Requests by Yukos to defer payment, allow payment by installments or to discharge the debt by sale of peripheral assets, including its shareholding in the Sibneft oil company, were also refused. The bailiffs froze Yukos’ shares in Yuganskneftegaz and on 19 November 2004, they placed a notice in the Russian government newspaper Rossiyskaya gazeta. Yuganskneftegaz would be sold at an auction thirty days later on 19 December 2004. The conditions for participation in the auction included an advance deposit of US $1.7 bn and prior clearance by the Russian Federal Antimonopoly Service. In early December 2004, Gazprom submitted an application to participate in the auction via its wholly owned subsidiary, Gazpromneft. On 15 December 2004, Yukos filed for a bankruptcy protection in a Houston court, and obtained a temporary injunction prohibiting Gazprom from participating in the auction. On 16 December 2004, a group of Western banks withdrew their financial support for Gazprom's application. On the same day, Baikalfinansgrup, a previously unknown company, applied to participate in the auction. On 19 December 2004, only two companies appeared at the auction, Gazpromneft and Baikalfinansgrup. Gazpromneft declined to place any offer. Baikalfinansgrup acquired Yuganskneftegaz on its first bid. On 23 December 2004, Baikalfinansgrup was acquired by Rosneft. Rosneft later disclosed in its annual financial statement that it had financed the acquisition of Yuganskneftegaz. At the time, Sergey Bogdanchikov was the president of Rosneft and the chief executive officer of Gazpromneft. Shortly after the auction, the planned merger between Gazprom and Rosneft merger was abandoned, and Bogdanchikov resigned his post as chief executive officer of Gazpromneft. On 7 February 2006, in response to a question by a Spanish journalist, Vladimir Putin disclosed that Rosneft had used Baikalfinansgrup as a vehicle to acquire Yuganskneftegaz in order to protect itself against litigation. Gazprom's oil drilling in the Arctic has drawn protests from environmental groups, particularly Greenpeace. Greenpeace has opposed oil drilling in the Arctic on the grounds that oil drilling would cause damage to the Arctic ecosystem and that there are no safety plans in place to prevent oil spills. In August 2012, Greenpeace had staged protests against the Prirazlomnaya oil platform, the world's first off-shore Arctic drill site. On 18 September 2013, the Greenpeace vessel MV Arctic Sunrise staged a protest and attempted to board Gazprom's Prirazlomnaya oil platform, the world's first off-shore Arctic drill site. Greenpeace stated that the drill site could cause massive disruption to the Arctic ecosystem. After arresting two campaigners attempting to climb the rig, the Russian Coast Guard seized control of the Greenpeace ship by making a helicopter drop, and arrested thirty Greenpeace activists from sixteen different nationalities. The Arctic Sunrise was towed by the Russian Coast Guard to Murmansk. The Russian government intended to charge the Greenpeace campaigners with piracy and hooliganism, which carried a maximum penalty of fifteen years imprisonment. Greenpeace argued their operatives were in international waters. The Russian government's actions generated protests from governments and environmentalists worldwide. According to Phil Radford, Executive Director of Greenpeace in the US at the time, the reaction of the Russian coast guard and the courts were the "stiffest response that Greenpeace has encountered from a government since the bombing of the Rainbow Warrior in 1985." The charges of piracy were dropped in October 2013. In November 2013, twenty-seven of the campaigners were released on bail. Greenpeace has not staged a protest at Prirazlomnaya oil platform since, instead choosing to protest against Western drilling operations due to those countries being considerably more tolerant of their activities. In May 2014, the first shipment of Arctic oil arrived at a refinery in the Netherlands and was purchased by the French company, Total. ^ a b c "PJSC Gazprom Financial Report 2017" (PDF). FBK. 30 March 2018. p. 87. Retrieved 5 October 2018. ^ "PJSC Gazprom Financial Report 2017" (PDF). FBK. 30 March 2018. p. 85. Retrieved 15 September 2018. ^ "PJSC Gazprom Financial Report 2017" (PDF). FBK. 30 March 2018. p. 86. Retrieved 5 October 2018. ^ "Gazprom Group Personnel structure". Gazprom. Retrieved 31 August 2018. ^ a b c "Equity capital structure". Gazprom. 2018. Retrieved 15 September 2018. ^ "Gazprom's New Headquarters Towers Over All Others in Europe". ^ Crumley (7 January 2009). "Russia's Gazprom Diplomacy: Turning Off Europe's Heat". Time. Archived from the original on 18 October 2015. Retrieved 25 April 2015. ^ "Gazprom - A Troubled Giant". Radio Liberty. Archived from the original on 16 October 2012. Retrieved 14 September 2012. ^ "Gazprom – Joint Stock Company". Gazprom. Archived from the original on 22 January 2009. Retrieved 18 October 2009. ^ a b c d e Goldman, Marshall I. (2008). "5". Petrostate: Putin, Power and the New Russia. Oxford University Press. ISBN 978-0-19-534073-0. ^ Aarentsen, Maarten (2003). National reforms in European gas. ^ "Kremlin agrees price for Gazprom." Archived 5 March 2016 at the Wayback Machine BBC News 16 June 2005. ^ "ОАО "Газпром" О компании / История / 2005 год". Gazprom.ru. Archived from the original on 19 March 2008. Retrieved 31 January 2010. ^ "Business | Gazprom opens doors to foreigners". BBC News. 24 June 2005. Archived from the original on 18 October 2015. Retrieved 28 August 2015. ^ "Full text in Russian". Rg.ru. Archived from the original on 14 June 2009. Retrieved 31 January 2010. ^ Neil Buckley and Tobias Buck, "Duma votes for Russian gas export monopoly" Archived 27 May 2007 at the Wayback Machine, The Financial Times, 16 June 2006. ^ "Duma approves Gazprom export bill" Archived 5 March 2016 at the Wayback Machine, BBC News, 5 July 2006. ^ Naeem, Asad. "EU launches anti-trust case against Gazprom: Commission". Business Recording. Archived from the original on 17 September 2013. Retrieved 4 September 2012. ^ "Russia's Putin signs 30 year gas deal with China". BBC News. 21 May 2014. Archived from the original on 11 February 2016. ^ "China and Russia sign $400 billion 30-year gas deal". Russia Herald. Archived from the original on 22 May 2014. Retrieved 22 May 2014. ^ Mitrova, Tatiana (9 September 2014). "Looking East Amid a Crisis to the West: Russia's Energy Export Strategies". NBR Interview. Archived from the original on 13 October 2014. Retrieved 16 October 2014. ^ "Russia To Start Supplying Gas To China By Pipeline In December 2019". Radio Free Liberty. 5 July 2017. Archived from the original on 5 July 2017. ^ "Russian TV station loses freedom". BBC News. 3 April 2001. Archived from the original on 25 August 2012. Retrieved 31 January 2010. ^ "Russian NTV viewers on the streets". BBC News. 8 April 2001. Retrieved 31 January 2010. ^ Tremlett, Giles (24 April 2001). "Putin is out to get me, says media tycoon World news, The Guardian". London: The Guardian. Retrieved 31 January 2010. ^ "Russian NTV handed to Gazprom". BBC News. 4 May 2001. Retrieved 31 January 2010. ^ Yenikeyeff, Shamil, "BP, Russian billionaires, and the Kremlin: a Power Triangle that never was" Archived 7 March 2016 at the Wayback Machine, Oxford Energy Comment, 23 November 2011. Retrieved 2011-11-24. ^ "Gazprom grabs Sakhalin gas stake". BBC. 21 December 2006. Archived from the original on 27 December 2008. Retrieved 31 December 2008. ^ Kramer, Andrew E. (23 June 2007). "Moscow Presses BP to Sell a Big Gas Field to Gazprom". New York Times. Archived from the original on 24 April 2009. Retrieved 29 June 2007. ^ "Gazprom, BP and TNK-BP enter into agreement on major terms of cooperation". Gazprom. 22 June 2007. Archived from the original on 14 May 2008. Retrieved 29 June 2007. ^ "Gazprom, Eni plan big gas pipeline bypassing Turkey." Archived 10 January 2009 at the Wayback Machine Reuters 23 June 2007 Accessed 26 June 2007. ^ "Eni and Gazprom sign the agreement for the South Stream Project." Archived 17 September 2013 at the Wayback Machine Eni.it 23 June 2007 Accessed 26 June 2007. ^ "Russia confirms decision to abandon South Stream". EurActiv. 1 December 2014. Archived from the original on 9 September 2015. Retrieved 28 August 2015. ^ "Видео споделяне / VBOX7". Vbox7.com. Archived from the original on 18 October 2015. Retrieved 28 August 2015. ^ Douglas Busvine (26 November 2013). "Gazprom expands Russian media empire". Reuters. Archived from the original on 18 October 2015. ^ "Update 2 -Gazprom in talks to buy Abu Dhabi's OMV stake-source". Archived from the original on 1 July 2014. Retrieved 27 June 2014. ^ a b c d e f g h i j k l "Gazprom in figures 2004-2008" (PDF). Gazprom. 2009. Archived (PDF) from the original on 1 January 2010. Retrieved 2 July 2009. ^ a b c d "Gazprom in Figures 2007-2011" (PDF). Gazprom. Archived (PDF) from the original on 3 March 2016. ^ a b c "Gazprom in figures 2009-2013" (PDF). Gazprom. 2014. Archived (PDF) from the original on 2 August 2014. Retrieved 13 December 2014. ^ Söderbergh, B., Jakobsson, K., Aleklett, K., 2010. European energy security: an analysis of future Russian natural gas production and exports. Energy Policy 38 (12), 7827–7843. ^ a b c Lunden, Lars; Fjaertoft, Daniel; Overland, Indra; Prachakova, Alesia (1 October 2013). "Gazprom vs. other Russian gas producers: The evolution of the Russian gas sector". Energy Policy. 61: 663–670. doi:10.1016/j.enpol.2013.06.055. Archived from the original on 8 April 2018. ^ a b c d e f g h i j k l m Stern, Jonathan P. (2009). "The Russian Gas Balance to 2015: difficult years ahead". In Simon Pirani. Russian and CIS Gas Markets and their Impact on Europe. Oxford University Press. ISBN 978-0-19-955454-6. ^ "Gazprom". Russia Profile. 2008. Archived from the original on 26 January 2009. Retrieved 2 July 2009. ^ a b "Questions and Answers: Production". Gazprom. Archived from the original on 22 January 2009. Retrieved 2 July 2009. ^ "Financial Times, September 28, 2005". Financial Times. 28 September 2005. Archived from the original on 13 August 2009. Retrieved 31 January 2010. ^ "Gazprom in figures 2012–2016" (PDF). Gazprom. 2017. Archived (PDF) from the original on 12 December 2017. Retrieved 11 December 2017. ^ "Gazprom in Figures 2011-2015" (PDF). Gazprom. Archived (PDF) from the original on 28 August 2017. ^ a b "Blue Stream". Archived from the original on 30 October 2014. Retrieved 30 October 2014. ^ "Gazprom and Total sign a Framework Agreement For Cooperation in the First Phase of Shtokman Development". OilVoice. 13 July 2007. Archived from the original on 27 September 2007. Retrieved 18 July 2007. ^ "Total signs on Shtokman dotted line". Upstream Online. NHST Media Group. 13 July 2007. Archived from the original on 27 September 2007. Retrieved 13 July 2007. ^ Gazprom (8 April 2013). "Gazprom and Shell agree to jointly develop Arctic shelf and produce shale oil in Khanty-Mansiysk Autonomous Area". Gazprom. Archived from the original on 28 August 2013. Retrieved 4 July 2013. ^ a b "FAQ: Transmission". Gazprom. Archived from the original on 22 January 2009. Retrieved 2 July 2009. ^ a b Mitrova, Tatiana (2009). "Natural gas in transition: systemic reform issues". In Simon Pirani. Russian and CIS Gas Markets and their Impact on Europe. Oxford University Press. ISBN 978-0-19-955454-6. ^ "Gazprom on Foreign Markets". Gazprom. Archived from the original on 22 January 2009. Retrieved 18 October 2009. ^ Von Matthias Streitz (8 January 2007). "Despot Lukaschenko: Schluss mit Druschba - SPIEGEL ONLINE". Spiegel.de. Archived from the original on 3 November 2011. Retrieved 28 August 2015. ^ "Russia, China Add to $400 Billion Gas Deal With Accord". 10 November 2014. Archived from the original on 28 February 2018. Retrieved 1 May 2018 – via www.bloomberg.com. ^ Wright, Chris. "$400 Billion Gas Deal Shows Russia Looking To China To Replace Western Money". forbes.com. Archived from the original on 11 October 2017. Retrieved 1 May 2018. ^ Luhn, Alec; Macalister, Terry (21 May 2014). "Russia signs 30-year deal worth $400bn to deliver gas to China". the Guardian. Archived from the original on 30 March 2018. Retrieved 1 May 2018. ^ Dempsey, Judy. "Europe Worries Over Russian Gas Giant's Influence". EnergyBulletin.net/The New York Times. Archived from the original on 14 May 2008. Retrieved 7 August 2008. ^ "Bulgaria, Russia's Gazprom Agree On Gas Deal". Radio Free Europe / Radio Liberty. 18 December 2006. Archived from the original on 17 June 2008. Retrieved 7 August 2008. ^ "Russia boosts gas exports to EU, holds talks with Ukraine". Taipei Times. 4 January 2006. Archived from the original on 26 July 2008. Retrieved 7 August 2008. ^ "Paying the piper." The Economist 4 January 2014. ^ a b c "China and Russia Reach 30-Year Gas Deal". 21 May 2014. Archived from the original on 22 February 2018. Retrieved 1 May 2018 – via NYTimes.com. ^ "Gazprom boosts natural gas production to solidify top position in Europe". RT International. Retrieved 2018-07-04. ^ "Gazprom restores Ukraine gas flow". BBC News. 5 March 2008. Archived from the original on 19 December 2008. Retrieved 31 January 2010. ^ Russian gas demands irk Belarus Archived 10 January 2007 at the Wayback Machine, BBC News, 18 December 2006. ^ "dn.kiev.ua/". Dn.kiev.ua. Archived from the original on 14 August 2011. Retrieved 31 January 2010. ^ "Business | Gazprom and Ukraine sign gas deal". BBC News. 13 March 2008. Archived from the original on 18 October 2015. Retrieved 28 August 2015. ^ "Gazprom hikes Ukraine gas price by a third". BBC News. 1 April 2014. Archived from the original on 5 January 2016. ^ "Russia and Ukraine 'agree gas supply deal'". BBC News. 30 October 2014. Archived from the original on 5 January 2016. ^ Lunden, Lars; Fjaertoft, Daniel; Overland, Indra; Prachakova, Alesia (2013). "Gazprom vs. other Russian gas producers: The evolution of the Russian gas sector". Energy Policy. 61: 663–670. doi:10.1016/j.enpol.2013.06.055. Archived from the original on 8 March 2018. ^ "Strategy". Archived from the original on 7 October 2014. Retrieved 30 October 2014. ^ "Contacts". Gazprom.com. 25 February 1993. Archived from the original on 15 July 2015. Retrieved 28 August 2015. ^ Leonid Bershidsky (2018-05-23). "A Fired Analyst Got Too Close to Gazprom's Truth: A report from Russian state bank Sberbank made the bold suggestion that Gazprom is run for its suppliers, not shareholders". Bloomberg.com. Retrieved 2018-05-24. ^ "Shares". Gazprom. 2018. Retrieved 15 September 2018. ^ "Gazprom". Gazprom.com. Archived from the original on 24 September 2015. Retrieved 9 August 2015. ^ "Gazprom". Gazprom. Archived from the original on 30 July 2008. Retrieved 31 January 2010. ^ "ОТЧЕТ ОБ ИТОГАХ ВЫПУСКА ЦЕННЫХ БУМАГ". Archived from the original (DOC) on 2007-06-30. Retrieved 2015-08-28. ^ "Schalke 04 extends partnership with Gazprom - Sports Sponsorship news - Soccer". SportsPro Media. Archived from the original on 31 October 2014. Retrieved 21 January 2013. ^ "Gazprom joins UEFA Champions League and UEFA Super Cup as an Official Partner". Gazprom.com. 9 July 2012. Archived from the original on 15 March 2013. Retrieved 21 January 2013. ^ "Latest News | News | Official Site | Chelsea Football Club". Chelseafc.com. Archived from the original on 5 August 2012. Retrieved 21 January 2013. ^ "FIFA deal with Gazprom unaffected by corruption scandal — spokesman". TASS.ru. Retrieved 14 July 2015. ^ "Rick Heede Biography". www.climatemitigation.com. Archived from the original on 23 March 2017. Retrieved 1 May 2018. ^ Douglas Starr (25 August 2016). "Just 90 companies are to blame for most climate change, this 'carbon accountant' says". Science Magazine. Archived from the original on 11 November 2016. ^ Overland, Indra (2016). "Ranking Oil, Gas and Mining Companies on Indigenous Rights in the Arctic". ResearchGate. Arran. Retrieved 2 August 2018. ^ "Российский фонд федерального имущества (далее - Продавец) извещает о проведении торгов по продаже арестованных акций ОАО "Юганскнефтегаз"". Archived from the original on 30 October 2014. Retrieved 30 October 2014. ^ "Bogdanchikov Appointed Head of Gazpromneft - Kommersant Moscow". Archived from the original on 30 October 2014. Retrieved 30 October 2014. ^ "Президент России". Archived from the original on 17 August 2009. Retrieved 30 October 2014. ^ a b Shaun Walker (24 September 2013). "Russia to charge Greenpeace activists with piracy over oil rig protest". The Guardian. Archived from the original on 25 September 2013. Retrieved 25 September 2013. ^ "Greenpeace International responds to allegations from Russian authorities". Greenpeace International. 22 September 2013. Archived from the original on 27 September 2013. Retrieved 25 September 2013. ^ "Armed Russian guards storm Greenpeace vessel in Arctic". Channel News Asia. 25 September 2013. Archived from the original on 27 September 2013. Retrieved 25 September 2013. ^ "Greenpeace activists could be charged with terrorism after ship stormed". the Guardian. Archived from the original on 30 October 2014. Retrieved 30 October 2014. ^ "Greenpeace Storms Prirazlomnaya Platform in Arctic". Archived from the original on 30 October 2014. Retrieved 30 October 2014. ^ "Greenpeace International responds to allegations from Russian authorities". Greenpeace International. Archived from the original on 30 October 2014. Retrieved 30 October 2014. ^ "Arctic Sunrise on Twitter: BREAKING: Dutch government issues formal demand to Russia for release of Greenpeace crew and ship". Archived from the original on 18 October 2015. Retrieved 30 October 2014. ^ Lally, Kathy; Englund, Will. "U.S. Greenpeace captain jailed in Russia". The Washington Post. Archived from the original on 1 October 2013. Retrieved 2 October 2013. ^ "Russia drops piracy charges against Greenpeace group". BBC News. 23 October 2013. Archived from the original on 25 October 2013. ^ "First Arctic Sunrise activist granted bail on Friday - News - Russia - The Voice of Russia: News, Breaking news, Politics, Economics, Business, Russia, International current events, Expert opinion, podcasts, Video". The Voice of Russia. Archived from the original on 31 October 2014. Retrieved 28 August 2015. ^ Carly Chynoweth (30 April 2014). "Total's purchase of Arctic oil shipment sparks row over offshore exploration". Guardian. Archived from the original on 12 May 2014. Retrieved 13 May 2014. ^ "Ukrainian Naftogaz transfers to Gazprom more than $ 1 billion for imported in October gas | Business | RIA Novosti". En.rian.ru. 1 January 2009. Archived from the original on 20 October 2012. Retrieved 21 January 2013. The Shtokman field, one of the world's largest natural gas fields, lies in the northwestern part of the South Barents Basin in the Russian sector of the Barents Sea, 600 kilometres (370 mi) north of Kola Peninsula. Its reserves are estimated at 3.8 trillion cubic metres of natural gas and more than 37 million tons of gas condensate. The Urengoy gas field in the northern West Siberia Basin is the world's second largest natural gas field after South Pars / North Dome Gas-Condensate field. The gas field has over ten trillion cubic meters (1013 m³) in total deposits. It lies in Yamalo-Nenets Autonomous Okrug in Tyumen Oblast of Russia, just south of the Arctic circle and named after the settlement of Urengoy. PJSC Rosneft Oil Company is a Russian integrated energy company headquartered in the Russian capital of Moscow. It is specializing on exploration, extraction, production, refinement, transport, and sale of petroleum, natural gas, and petroleum products. The company is controlled by the Russian government through the Rosneftegaz holding company. Its name is a portmanteau of the Russian words Rossiyskaya neft'. The Russia–Ukraine gas disputes refer to a number of disputes between Ukrainian oil and gas company Naftohaz Ukrayiny and Russian gas supplier Gazprom over natural gas supplies, prices, and debts. These disputes have grown beyond simple business disputes into transnational political issues—involving political leaders from several countries—that threaten natural gas supplies in numerous European countries dependent on natural gas imports from Russian suppliers, which are transported through Ukraine. Russia provides approximately a quarter of the natural gas consumed in the European Union; approximately 80% of those exports travel through pipelines across Ukrainian soil prior to arriving in the EU. Not to be confused with Novatek Inc, a US company that produces synthetic diamonds for the oil and gas industry. South Stream was a pipeline project to transport natural gas of the Russian Federation through the Black Sea to Bulgaria and through Serbia, Hungary and Slovenia further to Austria. The Sakhalin–Khabarovsk–Vladivostok pipeline is a pipeline for natural gas in Russia, transporting Sakhalin's gas to the most populated and industrialized regions of the Russian Far East. It is also projected to become a part of an international export route, carrying Russian gas to East Asian countries, such as the People's Republic of China, South Korea and Japan. The pipeline is owned and operated by Gazprom. It was opened on 8 September 2011. The Power of Siberia pipeline is a natural gas pipeline under construction in Eastern Siberia to transport Yakutia's gas to Primorsky Krai and Far East countries. The 2005–06 Russia–Ukraine gas dispute was between Ukrainian state-controlled oil and gas company Naftogaz Ukrainy and Russian national gas supplier Gazprom. The disagreements concerned natural gas supplies, prices and debts. The conflict started in March 2005, ended in January 2006 and, in addition to the gas companies, involved politicians from both countries. Prirazlomnoye field is an Arctic offshore oilfield located in the Pechora Sea, south of Novaya Zemlya, Russia, the first commercial offshore oil development in the Russian Arctic sector. The field development is based on the single stationary Prirazlomnaya platform, which is the first Arctic-class ice-resistant oil platform in the world. Commercial drilling was planned to begin in early 2012, however it was delayed at least until the Spring of 2013 due to protester's "safety concerns". Safety concerns have been raised about Prirazlomnoye platform, citing use of decommissioned equipment, however Gazprom’s oil spill response plan for Prirazlomnaya was renewed in 2014, and most questions found its answers. The Arctic Prirazlomnoye field produced the 10 millionth barrel of Russian North Arctic Oil in March 2016. The East-Prinovozemelsky field is a gigantic undeveloped Arctic oil and gas field located in the South Kara basin of the continental shelf of Russia, in the South Kara Sea between the Yamal Peninsula and Novaya Zemlya island. It is the continuation of the continental West Siberian hydrocarbon province. Chayanda field is a large hydrocarbon resource field, primarily of natural gas and gas condensates. It is located in the Lensky District of the Sakha Republic in Yakutiya. As of 2013, the Russian Federation is the world's second-largest producer of natural gas, producing an estimated more than 669 billion cubic meters (bcm) of gas a year, and the world's largest exporter, shipping an estimated 196 bcm a year. TurkStream is a natural gas pipeline running from the Russian Federation to Turkey. It runs from Russkaya compressor station near Anapa in Krasnodar Region across the Black Sea to Kıyıköy on the Turkish Thrace coast. It is replacing the cancelled South Stream project. The natural gas transmission system of Ukraine is a complex of natural gas transmission pipelines for gas import and transit in Ukraine. It is one of the largest gas transmission systems in the world. The system is linked with natural gas transmission systems of Russia and Belarus on one hand, and with systems of Poland, Romania, Moldova, Hungary and Slovakia on other hand. The system is owned by Government of Ukraine and operated by Ukrtransgaz. Some local transmission lines together with distribution sets are owned by regional gas companies.